Nos últimos anos temos acompanhado um crescimento significativo da área de neuroimunologia. Cada vez mais tem sido aceito não só o conceito de que o sistema nervoso tem a real capacidade de modular a resposta imune, mas também de que células residentes, como células da micróglia, astrócitos e mesmo neurônios participam ativamente da resposta imune em processos neuroinflamatórios. A expressão de receptores para neurotransmissores em células imunes, linfócitos T secretores de acetil-coina, a resposta anti-inflamatória vagal e mais recentemente a descrição do sistema linfático do sistema nervoso, são alguns desses exemplos. Nesse contexto, convido a todos a submeter artigos ou revisões na área mencionada em um volume especial editado por mim juntamente com outros pesquisadores. Central nervous system resident glial cells, whose role was long described solely as both metabolic and structural supporters for neuronal function, have lately gained more and more attention from immunologists. In fact, besides their well-known importance in tissue homeostasis, astrocytes, microglial cells, and oligodendrocytes have also been described as important players during neuroinflammation. is is due to the capacity to secrete many important inflammatory mediators, as cytokines, chemokines, metaloproteinases, and many others, as well as through the capacity to directly interact with infiltrating inflammatory cells, as observed during antigen presentation to T lymphocytes. For instance, it is known that both astrocytes and microglial cells constitutively express the receptors for IFN- and IL-17, rendering them target for inltrating Th1 and Th17 cells, respectively. Thus, the importance of resident glial cells in the establishment and maintenance of the neuroinflammatory milieu has become unquestionable. However, there are still many gaps in the understanding of the interplay between resident glial cells and inflammatory leukocytes. In this context, researches in multiple sclerosis and its model, experimental autoimmune encephalomyelitis (EAE), had greatly contributed to a better view of the mechanisms involved. 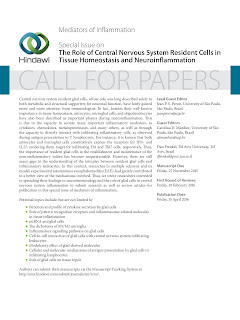 us, we invite researchers interested in spreading their findings in neuroimmunology and the role of glial cells in central nervous system inflammation to submit research as well as review articles for publication in this special issue of mediators of inflammation. 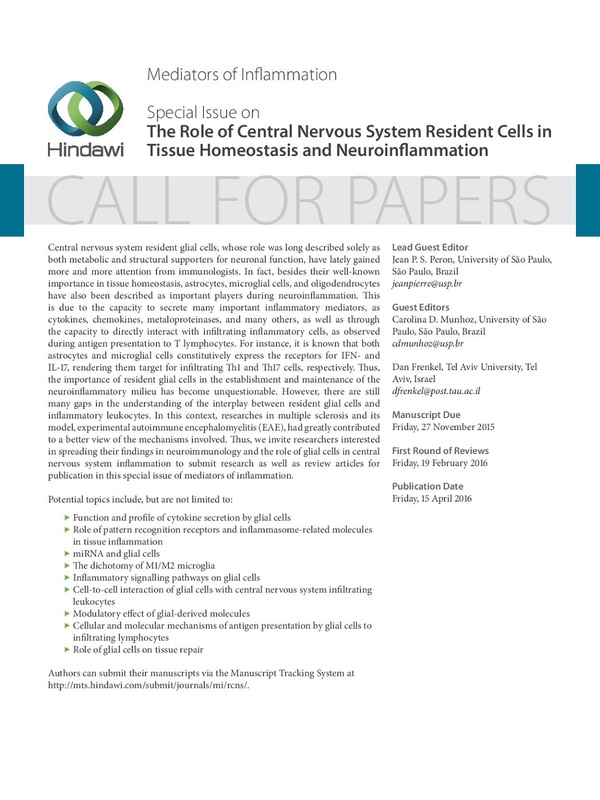 Authors can submit their manuscripts via the Manuscript Tracking System at http://mts.hindawi.com/submit/journals/mi/rcns/.